Head on over and print your coupon for 40% off any Regular Priced item at Hobby Lobby through November 5th. If you are looking for more great retail savings, make sure to check out the Retail Deals page! Disney Movie Rewards - Bonus Point Codes for New Members! UPDATED : These codes are for New Disney Movie Rewards Members only. Here are a few more codes to add in some BONUS points to your Disney Movie Rewards Account! Make sure you are entering your codes from the inside of every Disney DVD you purchase! You can earn FREE Movies, Disney Items and More! Tide w/Bleach Alternative (Clean Breeze) 50-ounce Bottle as Low as $3.99! Here is a hot deal if you can stand to wait for it! 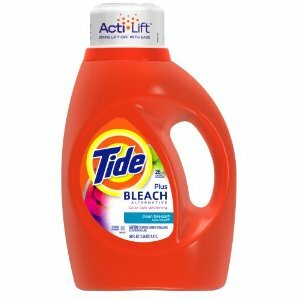 Right now on Amazon you can pick up this Tide with Bleach Alternative Clean Breeze Scent with Actilift, 50-Ounce for just $3.99 after clipping the $2.00 off coupon below the product. Because this item is in high demand, it show shipping time being 1-2 months but if you can wait for the deal -- it is a great one! Final Price: As low as $8 for 3 after a $1/1 Mobile TQ, two .50/1 TQ ad a $2/3 MQ or $2.66 each. ~Buy 2 and use a $3/2 TQ and two $2/1 MQs to pay $2.98 for 2 or $1.49 each.